Explore the inside story of the 1962 Cuban Missile Crisis. Premiering on the 50th anniversary of the Cuban Missle Crisis, Cuban Missile Crisis: Three Men Go to War focuses on three central figures in the crisis — President John F. Kennedy, Soviet Premier Nikita Khrushchev and Cuban leader Fidel Castro. 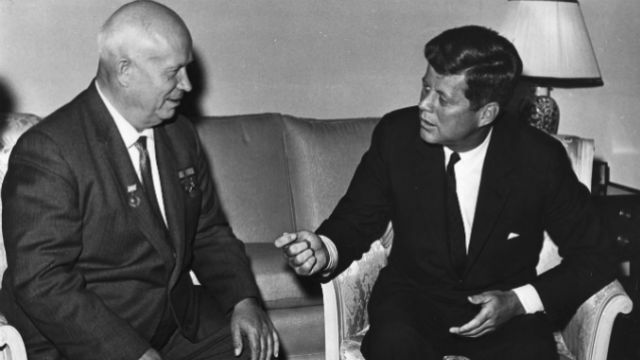 Nikita Khrushchev and John F. Kennedy in Vienna. Courtesy of John F. Kennedy Presidential Library. On October 22, 1962, President John F. Kennedy informed the world that the Soviet Union was building secret missile bases on the island of Cuba, 90 miles off the shores of Florida. The events of the next tension-filled 13 days, known as the Cuban Missile Crisis, struck fear across the globe as the world teetered on the edge of nuclear disaster. The fate of the planet ultimately lay in the hands of three powerful men: Khrushchev, Castro and Kennedy. Cuban Missile Crisis: Three Men Go to War explores the roles the three leaders played during some of the most dangerous moments in history, set against the human stories of ordinary men in the field such as the Soviet man who shot down the U2 piloted by U.S. Air Force Major Rudolf Anderson on the worst day of the crisis. The film features interviews with key witnesses and experts, including Sergei Khrushchev, son of the former Soviet premier; Ted Sorensen, former member of the renowned Executive Committee of the U.S. National Security Council; former KGB and CIA operatives; and Captain Jerry Coffee, the reconnaissance pilot who made a split second decision to veer off course in Cuba and revealed a new type of nuclear weapon that could have annihilated invading American forces. An edge-of-your seat tale of espionage and intrigue at the highest level, Cuban Missile Crisis: Three Men Go to War offers perspective on one of the most harrowing times in modern history. and co-directed by Murray and Emer Reynolds.